To my consternation -- given my hopeless devotion to books -- I found that my first child could not have been less interested in books. He fidgeted, then bawled. Perhaps there was something about the green sheep that just didn't appeal. He certainly didn't give a damn where it was. If bub is more interested in chewing it than reading it, fret not. 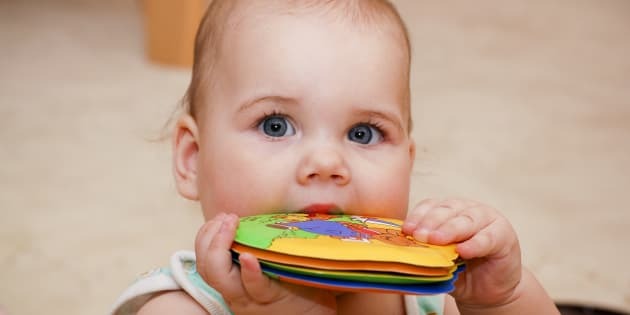 Forget Sudoku for toddlers, in utero Mozart concertos and Baby Einstein DVDs, one of the best ways to promote babies' development is to read to them. And it is never too early for parents to start reading to their children, with the years from birth to five critical for building literacy skills. That is all well and good, but what happens if your little one just doesn't like books? To my consternation -- given my hopeless devotion to books -- I found that my first child could not have been less interested in books. Day after day, I got into position on the couch, channeling photos I'd seen of parents cradling happy infants in the crook of their arm while they read to them. I put on my best school librarian voice, equaling anything Dame Judy Dench could offer. My son fidgeted, then bawled. Perhaps there was something about the green sheep that just didn't appeal. He certainly didn't give a damn where it was. I remembered author and academic Frank Serafini's quote: "There is no such thing as a child who hates to read; there are only children who have not found the right book." But things didn't improve much in the next 12 months. My son might have been fascinated by lights, drainpipes and any type of lever, but he could not care less for a story or a book. My husband and I tried bath books, bed books, pop-up books, glow-in-the-dark and wind-up-train-driving-over-the-page books. But he was far more interested in the heating vent. All of this was upsetting, as I knew the benefits of reading to babies from as early an age as possible. According to the Australian Government's Raising Children website, sharing stories with babies helps them become familiar with sounds, words and language, eventually building early literacy skills and improving their reading skills later in life. It also stimulates babies' imaginations and helps them learn about the world. In addition, reading to babies can form important bonds that also improve their development. Studies on babies and toddlers have revealed the frequency in which they are read to is also significant. The Melbourne Institute of Applied Economic and Social Research measured the developmental benefits of reading to young children, revealing those aged four or five years who are read to three to five times a week had the same reading ability as children six months older (who are read to only twice or less a week). In addition, reading to children six to seven days a week puts them almost a year ahead of those who are not being read to. Interestingly, reading to small children also had a beneficial impact on numeracy skills. Choose the right time to read. Apparently, one of the big mistakes new parents make is to read to babies before bed or nap time. At this point, they are tired, fidgety and irritable. A better time to read is when they wake from their nap or during their play time, when they will be more alert and open to sitting still on their parents' laps with a book. The Very Hungry Caterpillar is wonderful for babies in its language and presentation, with holes that curious babies can poke their fingers through, numbers and a wide range of words and sounds. The "That's Not My..." series is also popular with babies, introducing them to different textures, which can be beneficial for their development. Some children love trains and cars. Others are interested in animals and nature. Some love fairies. Others are fascinated by monsters. Find books that appeal to your child's interests. Even if you can't get through the whole story, you can talk about the pictures and make associated sounds (roar like a lion, toot like a train), which provides many of the benefits of reading. Let children see how much you love to read. Your interest in books will be infectious as the child gets older and they are likely to model their behaviour on you. Even recognising how to open a book and turn pages is an advantage when children start school. Talk to your local librarian for advice and recommendations. In my research, I was interested to find out that infants should not be expected to maintain their attention for longer than about 90 seconds. Perhaps, in encouraging my baby to read, I had expected too much. Fortunately, by the time he turned three, my son gradually became interested in books, and at five, some of his favourites are The Lorax and the Hairy Maclary series. In fact, sometimes I have to hold myself back from sighing when he chooses one of the longer books on his bookshelf to read before bed. Essentially, it seems that the most important thing to remember when faced with a baby who doesn't seem to enjoy being read to is that every little bit helps. Don't worry if your baby loses interest after 10 seconds, or simply puts a book in their mouth and chews on it. Just handling a book is better than nothing, and will place your child on the long, infinitely entertaining road to becoming a talker, reader, writer, and, eventually, book lover. For more on books and reading, visit Readability books blog.